Kate Middleton may be just 13 days away from her official, July 13 due date, but we’re glad to see the expectant royal – and her baby bump – have been carrying on as normal. The Duchess of Cambridge has been spotted visiting the Rossano Ferretti Hair Salon for some pre-baby pampering, ahead of her new arrival. Kate Middleton was pictured entering the exclusive London salon – thought to be used by both her mother and her sister – in Mayfair last month. Her visit prompted rumours she has made a break from previous hairdresser – responsible for her much copied royal wedding ‘do – Richard Ward. Although it’s not known exactly what treatments pregnant Kate enjoyed during her visit to Rossano Ferretti, we’re sure she was in safe hands. In the past, Ferretti has tended the tresses of Hollywood starlets Angelina Jolie and Salma Hayek, as well as working on catwalk shows for both Armani and Dior. Pictures printed in Australian magazine Who show Kate Middleton looking happy and healthy, her baby bump on show in a fine knitted cardigan and flowing white skirt. Last week, the first pictures of Kate Middleton, baby and Prince William’s new home at Kensington Palace were revealed. 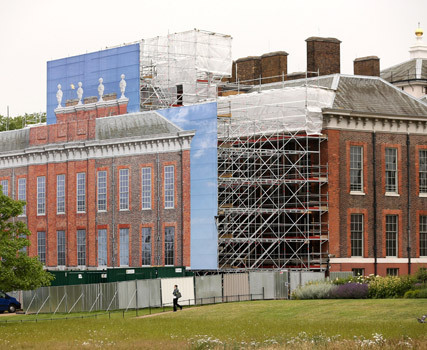 Although Apartment 1A at Kensington Palace is still under construction, sneaky snaps of the building site show just how extravagant the royal couple’s new home will be. So far, it’s thought the 21-room apartment has cost around £1million to renovate, but this figure includes work such as essential asbestos removal, which, according to Keeper of the Privy Purse, ‘would have been spent anyway’. Although Prince William and Kate Middleton’s new home won’t be ready for the arrival of the royal baby, it’s thought the family will move in later this year.